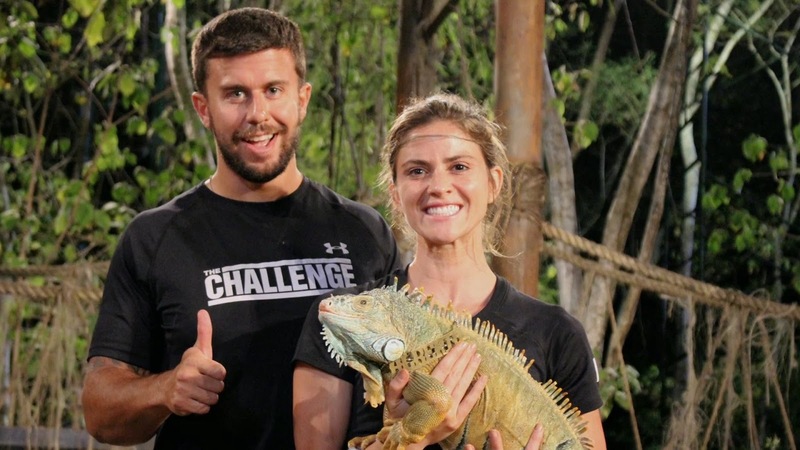 This episode of The Challenge: Rivals 3 literally had way too much going on! Picking up from last week, the house goes out for another night in Mexico! Tony stays getting drunk, and, as we've seen multiple times, he is an ANGRY drunk. At the club, he vents to Devin, telling Devin that he hates her which is hard for Devin to swallow, since he's interested in Camila. Once they get back to the house, Camila bumps into a drunk Vince, falls and gets scraped up. Camila, of course, goes off on him and Bananas for laughing. Later, the cousins even reenact the scene, and Camila goes off again, calling them bullies and then calling out a sleeping Tony out for "idolizing" them! The cousins end up waking Tony up, telling him to get Camila in check. Of course, Tony already has this harbored resentment towards her, so it ends up being a huge argument between the two of them. Clearly, Bananas and Vince wanted them to fight for some entertainment. Tony gets really up in her face, and even backs her into a corner. It almost comes off as he's about to lay hands on her, and two of the other guys eventually drag him away, while the girls pull Camila away and try to calm her down. Devin eventually talks to Tony and calms him down, but tells Tony that it was not okay that he backed her into a corner like that. It's absolutely crazy. What's crazier though is that all this happens in Tony and Camila's off time, and they go to challenges and put in work! The next day though, Tony doesn't even remember how things got started! T.J. mysteriously walks in, wanting to see everyone, and the house KNOWS that something is about to go down. He makes it short and sweet, telling them all that he warned them to calm down and keep things cool in the house, Because of Tony and Camila's huge blowup, T.J. sends them home! T.J. also tells everybody else to let that be a warning to them all. Huge fights like that will get you kicked out! It's really a shocker to everybody. As Tony and Camila pack, Bananas and Vince feel bad, because it could be said that maybe if they hadn't woken Tony up in the first place, this wouldn't have happened. That night, right after Camila and Tony left, the house gets a clue from T.J. saying that the next challenge starts in 20 minute! Everyone gets dressed and heads to The Jungle, where T.J congratulates them all on making it to the halfway mark. He decides he wants to give them a little reminder why they're all here with this challenge, "Up All Night!" The teams literally have to stay up all night, standing on boxes. Throughout the night, an air horn will sound, and they will move to a smaller box and then another even smaller box. Fall off or step down, you'll head straight to The Jungle! T.J. also warns them that they might want to pay attention throughout the night, because there will be a part two to the challenge: a mind game! The winner not only is safe from elimination and will choose two teams to go to The Jungle per usual, but they will also get $1000 each and a day trip! At the beginning of the challenge, the teams are standing on the boxes, talking and laughing to pass the time. All of a sudden, a mariachi band comes through and plays the same song over and over and over again! At least it keeps them awake though! It's driving everyone insane after a while...clearly a ploy to try to break them! Or is it? Sarah and Cory both figure out early for their teams that they need to pay attention to the details of what's going on throughout the night, while others play around. A bunch of random things happen after that throughout the night. A guy comes in, looking like he's a worker setting something up and starts climbing around on a structure in The Jungle. Then a motorcyclist comes in and spins in a few circles, and finally it starts to click with a few more teams that they should be paying attention to the details! Later a guy starts wielding on a garbage can, and lights another dude on fire!!! Because they figure it's all an act, and don't want to lose the challenge, no one in the cast helps the guy, though! Then comes in a guy with a donkey toting tacos, a man chasing another guy with a chainsaw, and a juggler who juggles balls and knifes. The last random person to come through is a guy with an iguana named Alberto that the cast gets to take pics with! It's really a bunch of random things and details that would be difficult to remember on a regular day, let alone when you're tired and have been standing on boxes all night. At 5 a.m., the delirium really starts setting in with everybody. The sun is rising, and the day goes on, but T.J. hasn't shown up! He gets there around 10:30, and lets them know that the challenge is really about to begin! Turns out that, inside the boxes, there are questions and answers on blocks that the teams have to work through. They have to put the events in order and answer questions about everything that happened so that the correct answers in the correct order. The first team to get everything right wins. And the episode ends with some of them knowing that they are royally SCREWED.